New Orleans is famous for its ghosts. From the crowds gathered outside the Lalaurie house on the corner of Royal and Governor Nichols to Marie Laveau’s tomb in old St. Louis Cemetery No. 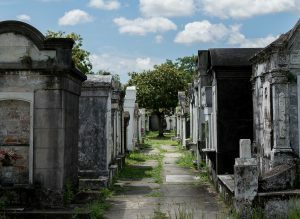 1, it’s no secret New Orleans is haunted. Even my favorite hotel, The Hotel Monteleone, is purported to have a ghost or two. I exploited the city’s haunted reputation in my novel Louie Morelli’s Mistress, adding a bit of the supernatural via Louie Morelli’s eccentric little girl. But ghost tours and fiction are fun. A not so fun reality is the appalling homelessness on the streets of the French Quarter and elsewhere throughout the city. The homeless outnumber the ghosts in New Orleans. And they haunt me in a way the Quarter’s ghosts never have. According to an August 2015 report from Unity of Greater New Orleans, homelessness in the Big Easy was down 85% percent from its post Katrina high in 2007, when close to 12,000 people were without shelter. In 2012 New Orleans had the second highest rate of homelessness in the nation. Today 46.9% of every 10,000 are homeless in New Orleans. I saw homeless on my last couple of post Katrina visits, but this past visit, coinciding with the last week of Jazz Fest 2016 was an eye opener. Homeless men haunted the underpasses on City Park Ave near Metairie Cemetery and huddled beneath the bridges of the Pontchartrain Expressway. These are the faceless people you see in every major metropolis; hungry, dirty, disheveled—the mentally ill and chronic abuser. Homelessness may be down, overall, in the city from its post Katrina high, but the amount of homeless in the French Quarter is disturbing. I’ve been travelling to New Orleans for a long time, and I have no recollection of homeless haunting the Quarter in the eighties and nineties. 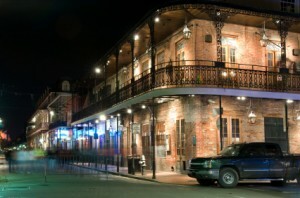 But then, I write mob fiction, and it’s understood that when the mob ran the city there were no homeless in the Quarter. Today, it’s the homeless youth that pierce the heart. Sprawled in the heat and dirt with their dogs, they rely—like Blanche Dubois—on the kindness of strangers. Softhearted tourists dispensing quarters and dollar bills. To be sure a minority of these panhandlers might be opportunists. Maybe they’re not all homeless. I sincerely hope this is the case. 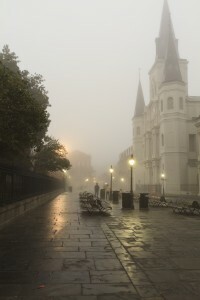 On my last morning in the Quarter I took a walk, encounterting a downtrodden young man hunched on the sidewalk, a yellow lab sleeping on a square of cardboard beside him. One sign read: “My dog ate my money.” He was nodding off, did not even look up when I dropped a couple of dollar bills into his box. Further down Royal Street a woman sat on a curb with a small white dog. I stopped and spoke with her, and she told me she and her husband have fallen on hard times. She told me she’s not sleeping on the street but in a van with her family. They’re hoping to collect enough money to drive to Arizona. I wished her well and walked on, dropping four quarters into the can of a homeless vet. My morning stroll takes me past the Lalaurie house, where a tour guide is telling the hideous tale of Madame’s tortured slaves. Her victims haunt the house, but on the narrow streets of the Vieux Carre another haunting is being born of desperation and shattered dreams. Patricia Bellomo is the author of the suspense thrillers Louie Morelli’s Mistress, Stella di Mare, Louie Morelli’s Daughter, and the award winning The Prince of Mafia Princes. All books available on Amazon.com.